The concept of linguistic sign was given by the famous linguistic Ferdinand DE Saussure (1857-1923). According to him, the pairing of word-labels and meaning concepts produce a system of signs. Each sign consists of two parts: a signifies i.e. a label and a signified i.e. the concept. It is important to note that the actual sign is not one or the other or both; the sign is the association the blinds the label and the concept together. In the pictures below , we give visual illustrations of the signs for “tree” and “book”. Notice that the sounds or letters involved in speaking or writing the words tree and book have nothing to do with the objects “tree” and “book”; any other set of sounds would do just as well. Hindi speakers, for example, use the sequence p-e-R for the object ‘tree’ and the sequence k-i-aa-b for the object ‘book’. However , once these correspondence are established, they acquire a fairly permanent place in out minds. The concept of the linguistic sign of the linguistic sign is often used to suggest that our thoughts are entirely formed by our language. Hindi speakers have only one word barf for the object for which English speakers have at least two i.e. ice and snow; and Eskimos have more than twenty. So speakers of Hindi, English and Eskimo languages perhaps see the world very differently and their perception are conditioned by their languages. Does everyone see the same number and kinds of colors? 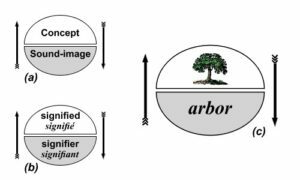 Do two different communities living in the same environment classify and categorize the flora and fauna around them in the same way? Is there only one ‘Reality’ there? Or is it the case, that different languages produce different versions of external reality? What happens to people who know and use many languages at the same time? 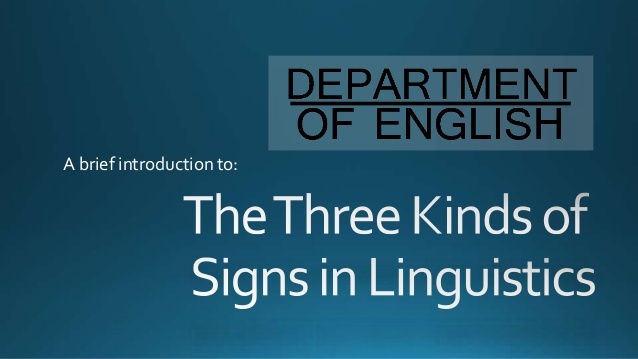 This entry was posted in Education News, English, English Grammar, Free Courses, Language programme, MEG and tagged English Grammar, English Language, Language, Language Program, The Concept of Linguistic Sign on June 14, 2018 by manish.